Thanks for sharing your process. Would you mind offering a couple of examples of tasks / activities which are easier to perform in Cubasis than Auria? (I don’t own the former so look forward to your review.) If you couldn’t use Cubasis, would Beatmaker 2 (which I do own) be still be superior to recording / organizing in Auria? Just curious. I am excited to see what you and PoD cook up in terms of collaboration. Thank you. I will expand a bit more on the strengths of Cubasis in my full review in the next few days. 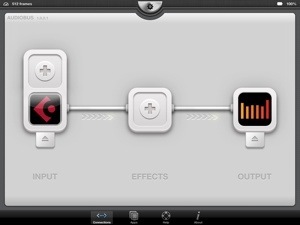 In short, Cubasis has a much easier, and reliable Audiobus integration & GUI. IMO. You can record Vritual MIDI in Cubasis as well. The waveform editor is in a sub screen on the lower half of the view to work on the wave outside the track, but affects the wave in whatever track it occupies when edited. It and all recordings can also be saved neatly in the Media section to keep organized. 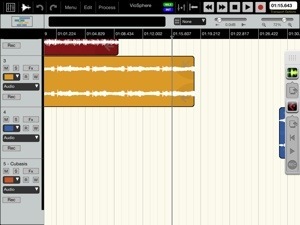 Also being able to quantize, transpose and edit individual notes or beats is very handy. There is also a customizable section of pads with variable velocity control. You can make chord assignments to pads or small buttons however you wish. Can’t do any of that in Auria. Of course the note editing & quantize only applies to MIDI or the internal Cubasis instruments, but still very nice. Moving, copying, arranging and looping throughout the tracks works much more smoothly than Auria. However as I’ve pointed out, Cubasis has virtually no capability of mastering anything, and the FX stink up to high heaven. Auria has Cubasis beat mightily there. As does Cusbasis where GUI is concerned. Both are sure to improve. This is all based on currently available production versions. BeatMaker2 is on the table for an in depth review. Now that I have all the iDAWs available I intend to look at them all, if not already. I haven’t installed BM2 for a while. If it supports Audiobus input, then it theoretically could work the same in place of Cubasis in my process scenario. I haven’t tried it. Whoa, that wasn’t so “in short” as I intended. Hope it helps? More coming in the reviews. I look forward to your review of the main DAWs out there. I don’t own Cubasis so look forward to learning what it does which makes you go through the bother of recording into Cubasis and exporting into Auria. From the screen shot above it looks like you record audio from some synths, and use the internal Cubasis MIDI / instruments for others. Music Studio seems similar based on this to Cubasis, but its main limitation in my experience is one audio sample per track. It also probably lacks the effects you like. Beatmaker 2 seems more complete, but the GUI is non-intuitive to me, though people who use it daily probably get used to it. More of a problem is that Beatmaker 2 causes Sampletank to crash / distort audio. Just opening Beatmaker 2 without enabling MIDI causes havoc. I will do my best to dig into my Cubasis review, thank you. Don’t read too much into the screenshots as they were just random files placed in tracks just for example. However I do like the Cubasis instruments well enough to use some, but I much prefer to bring in my own synth sounds from my many synths. Either way it works out. I’m fiddling with the virtual MIDI part more. Its working well. The GUI of Cubasis compared to BeatMaker 2 is better in my opinion. The FX are equally subpar to me. At $50 Cubasis & as you pointed out it looks and works a lot like much of what we’ve already seen in general. Ill say this in advance of my full review, I do feel Cubasis is not remotely worth $50. Its a very good app. Its not breaking any ground or doing anything so well, or different than anything at half its price. You’re paying for the brand more than anything else. i don´t have Cubasis, but wouldn´t it be so much more reliable, simple and faster to audiocopy every track in Cubasis and then audiopaste in Auria instead of recording in realtime each? 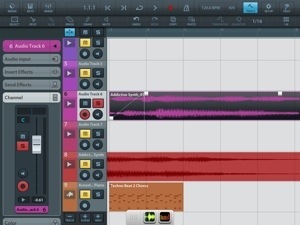 i am using a similar process only with Beatmaker2 in tandem with Auria instead of Cubasis. I can’t bring myself to spend $50 on something that isn’t the best at something in the ios music realm. I can easily drop $50 on Auria because it does things no other app does and I can access full VST plugins like FabFilter for splice 20% of their regular cost. Didn’t Steinberg create VST? I know it does some things well, but I think as it currently stand that thing is a joke and they are ripping people off and seeking an app on what it might be, not what it is. Honestly, I feel much the same way. I really wish I hadn’t spent the money. It was a tragic accident. So I’m trying to get something from it and make the best of it. Auria is far more advanced sonically, just not the greatest workflow, but its getting better. Cubasis is real nice where workflow is concerned, decent instruments, and Vmidi, but not any leap in any direction overall. It’s a lateral move. Doing as well as anything else has, but not pushing anything further. Safe. Good point. I don’t think Aurias GUI is a difficult area to improve upon. I think part of the point I was trying to make is about a safe release that shows nothing that sets a new benchmark is old hat. Auria released with options never seen on iOS at a high end. The GUI, needs work, but nothing that can’t be done. Then Cubasis comes out, but does nothing new, and doesn’t set any new benchmarks separating itself from the pack. Plenty of teases of upcoming improvements are nice, but again, nothing big, that’s an abused tactic. One I’ve been a victim of having false hope for over and again without satisfaction. For $50 I do expect something truly special and unique with the things I need. I really hope you’re right and Steinberg ups its game with Cubasis and fast. Thank you for joining the discussion, I appreciate your input.